two + = 10 Required Please enter the correct value. You see, the S&P 500 has returned an average of 7.4% since 2004. 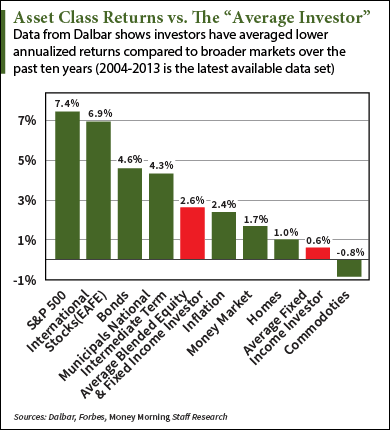 By comparison, the average investor has only seen a 2.6% net annualized rate of return in the same period, according to the latest data from Dalbar's Quantitative Analysis of Investor Behavior (QAIB). This 4.8% difference can be chalked up to three traps investors are prone to fall into — no matter their approach. "It turns out that every investor is hardwired to do three things that kill returns," said Money Morning Chief Investment Strategist Keith Fitz-Gerald. Fitz-Gerald has helped countless investors over his 30-plus year career and sees the same mistakes over and over. Exactly what are the biggest investment mistakes that kill returns? In 2008, stocks began to fall at the beginning of the Great Recession. Still, most investors refused to sell at a loss. The market continued to fall, but investors held on. Ultimately, many sold near the bottom, and missed the March 2009 upswing. The events of 9/11 also provide example. "Most of the world's major markets bottomed within minutes of each other on short-term panic and emotion," Fitz-Gerald said. "Then, when trading resumed days later, they began to climb almost in sync as highly localized events once again faded into the longer-term fabric of our world." Fitz-Gerald chalks it up to the way the brain works. "Human memories tend to focus on recent events more emotionally than they do longer-term plans that are put together with almost clinical detachment," Fitz-Gerald said. And focusing on short-term market movements distracts from long-term wealth-building plans. What are the positives? How are these defined and applied?